After snagging magazine after magazine, MBLAQ has been melting fan girl's hearts with their voluptuous photoshoots. Every picture has its story right? 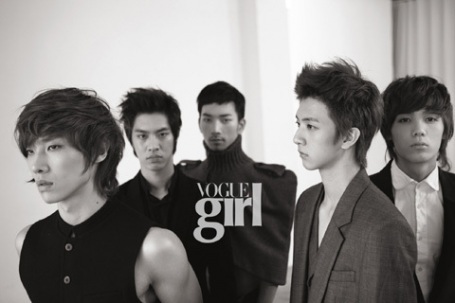 So vogue girl have been kind enough to give us behind the scenes from the previous Vogue Girl photoshoot the mblaq boys had. You see the guys playing around during the photoshoot totally confident and comfortable with the environment. Kittens running everywhere, pretty relax. Mir drinking milk from a bottle? oh maknae still has milk on his tongue~ 6 pack Joonie flaunting his chocolate abs. world k-pop news: [video] MBLAQ for VOGUE Girl Behind The Scenes "clickable"
0 Response to "[video] MBLAQ for VOGUE Girl Behind The Scenes"